I created these creepy concoctions as part of a sponsored post for Collective Bias, inc. All recipes, images and opinions are my own. In case you didn’t know, I’m a huge Halloween fan. I love everything about it – the festivities, the decor, the crafts, but most of all I love the food! 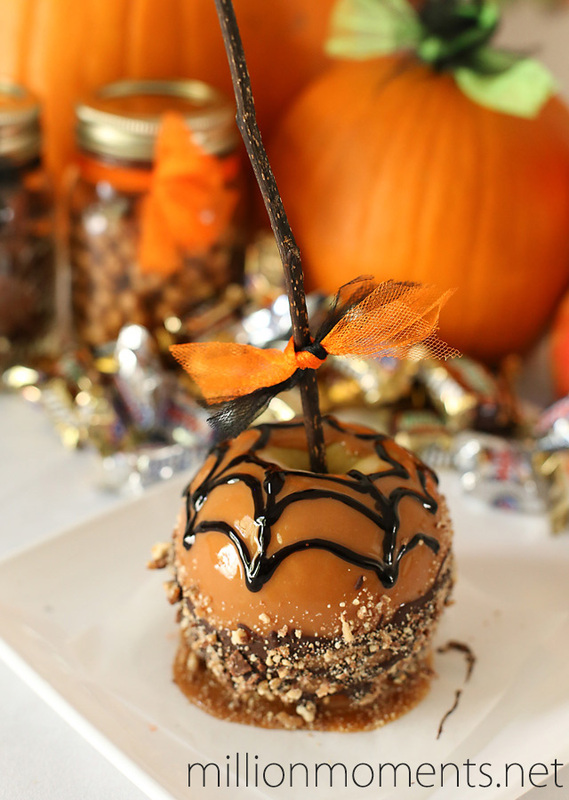 I mean, what Halloween celebration would be complete without decadent candy dishes and spooky concoctions of yummy goodness? Not one I ever want to see! 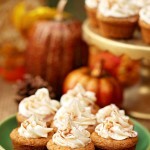 With that said, I will go ahead and get down to it with two of my new favorite Halloween recipes. 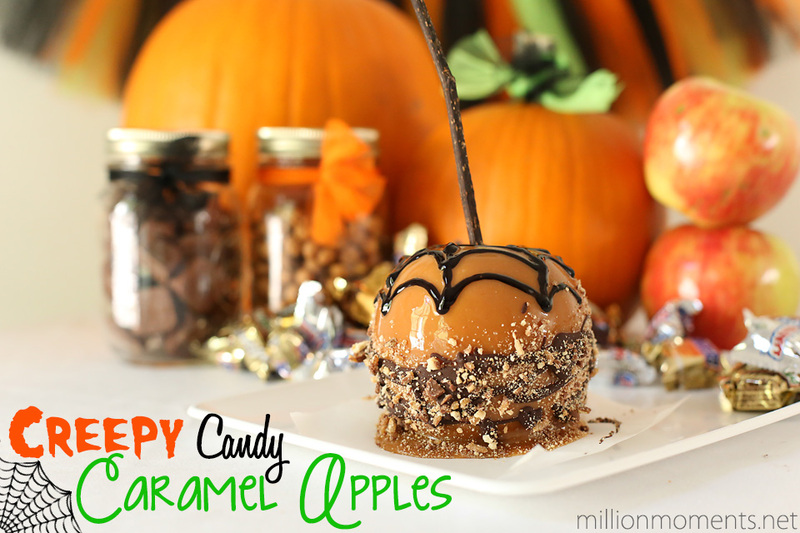 The first is a caramel apple creation dipped in Mars minis and the second is a super easy Hawaiian eyeball punch. Yum, right?! Now lets get started! 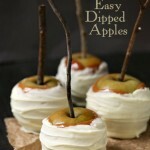 For this recipe you will spend as much time in preparation as you will making your apples, and once you start it goes fairly quickly so you want to make sure you have everything prepared and set up before you start. The first thing you need to do is get the wax off of your apples. 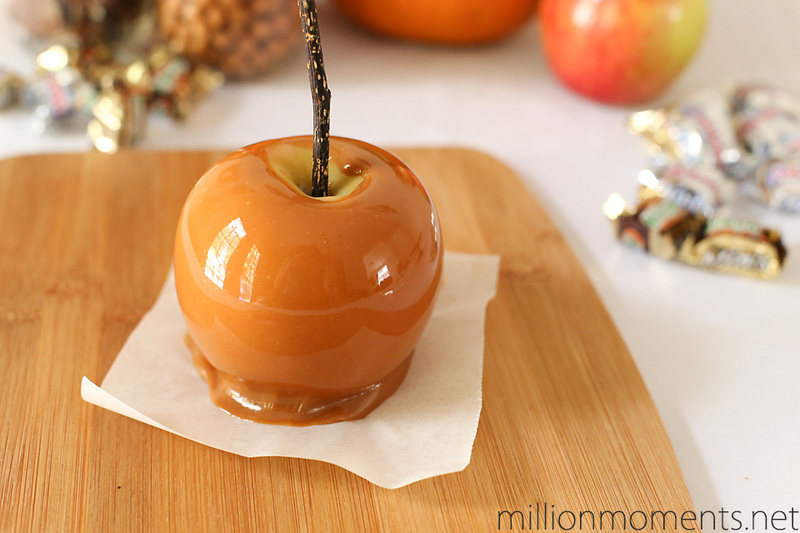 *This is very important – the caramel won’t stick unless you do* Place them in a bowl of hot water for around 15 seconds (too much and it will soak up some of the water) then “buff” them with a napkin or towel to get the wax off. Pop out the stem and insert a stick in its place, making sure to push it at least halfway down the apple. 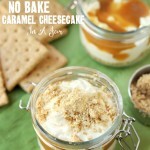 After that I like to put them in the fridge while I get everything else ready so they are nice and cool when I dip them in the caramel. 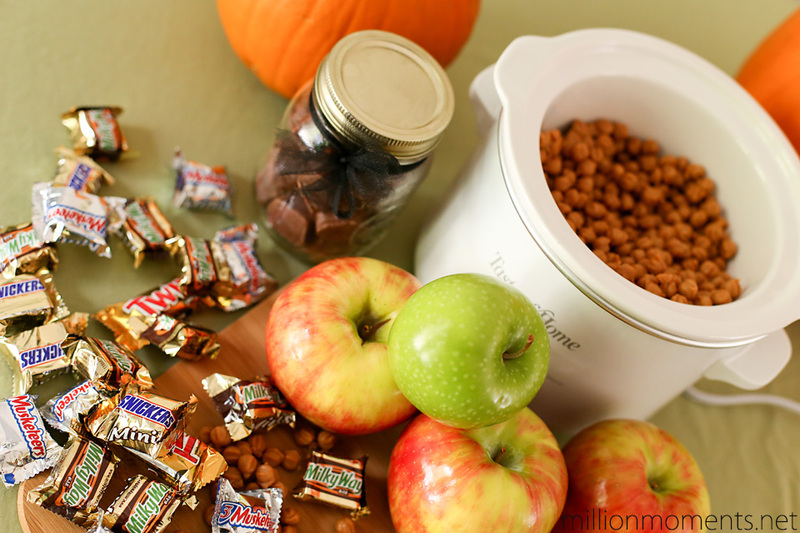 Next chop up your candy bars and put them in a bowl. Depending on how many apples you plan to make you are going to want to get a big bag so you have more than you think you need. I got a big (230 piece) bag of Mars Mixed Miniatures and used about a third of it for four apples. FYI: Save the 3 Musketeers for the trick-or-treaters, they don’t chop as well as the others. 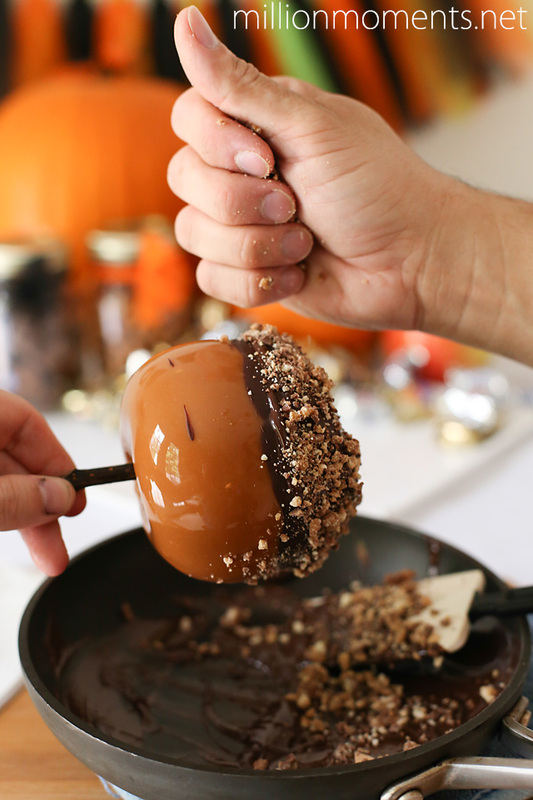 Now dip the bottom half into your chocolate and then immediately sprinkle your candy onto it so it sticks. 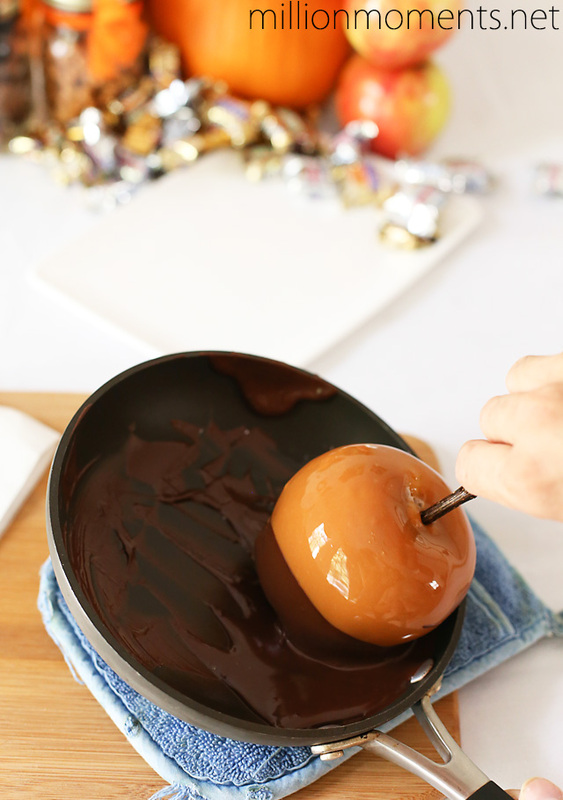 You can also dip into your candy, but I like this way better. 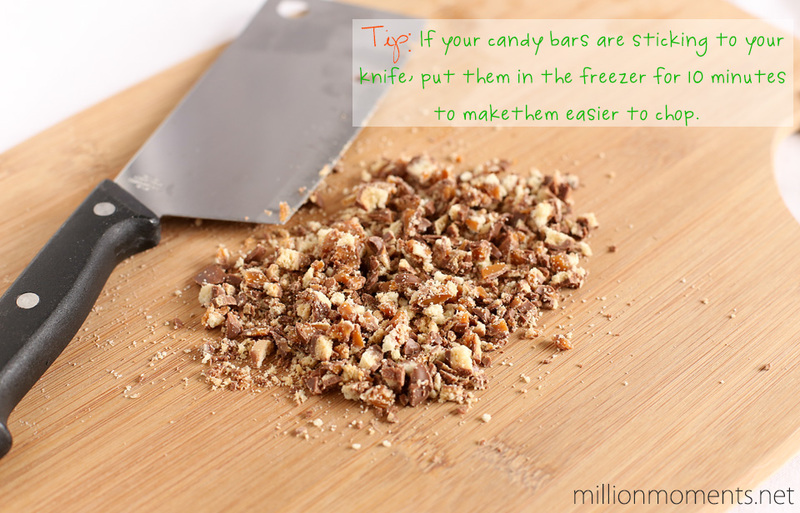 Put them in a cool spot to firm up (if you find they are dripping stick them in the fridge). They already look super delicious, huh? But you still have one more step. 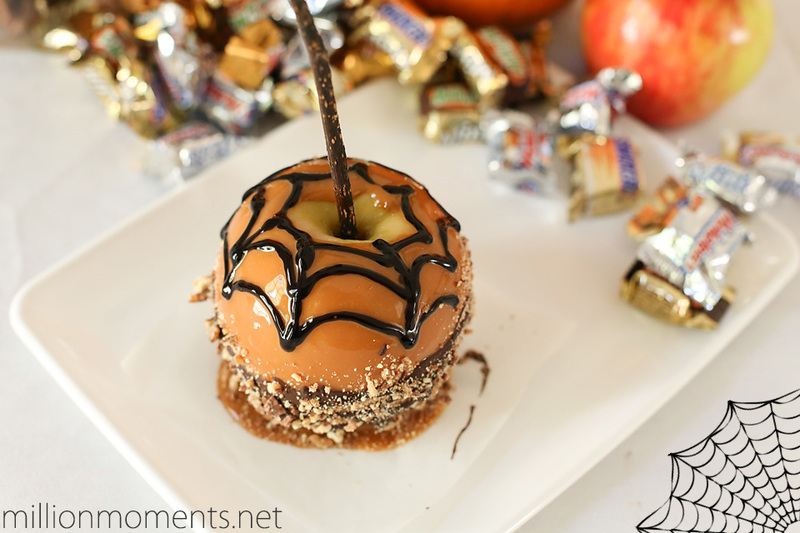 Take your decorating chocolate gel and draw a spider web on the top of your apple. Don’t worry if you don’t get it perfect, it will still look awesome! Whew, that was quite a recipe but after all your hard work you will have an amazing dessert fit for even the finest Halloween celebrations! Now that we have our decadent dessert finished it is time to whip up a quick Halloween punch to go along with it. 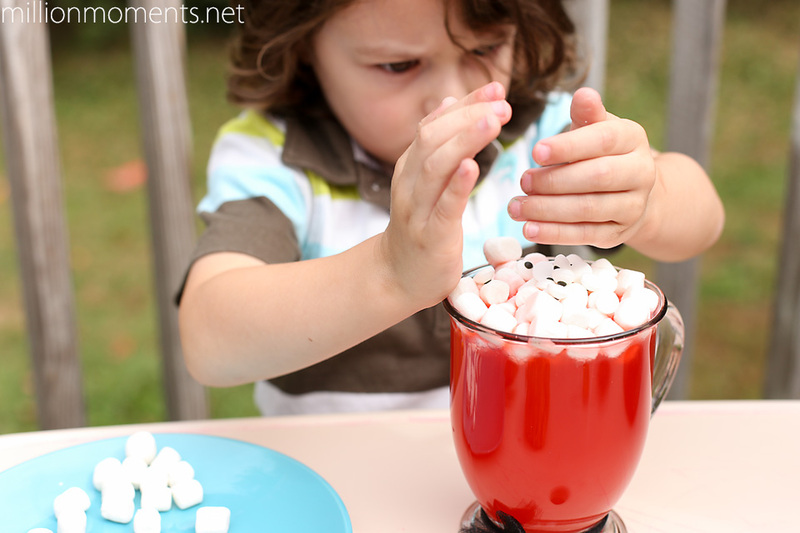 This is a great recipe to make with the kids – Judah helped me and had a blast with all the marshmallows! 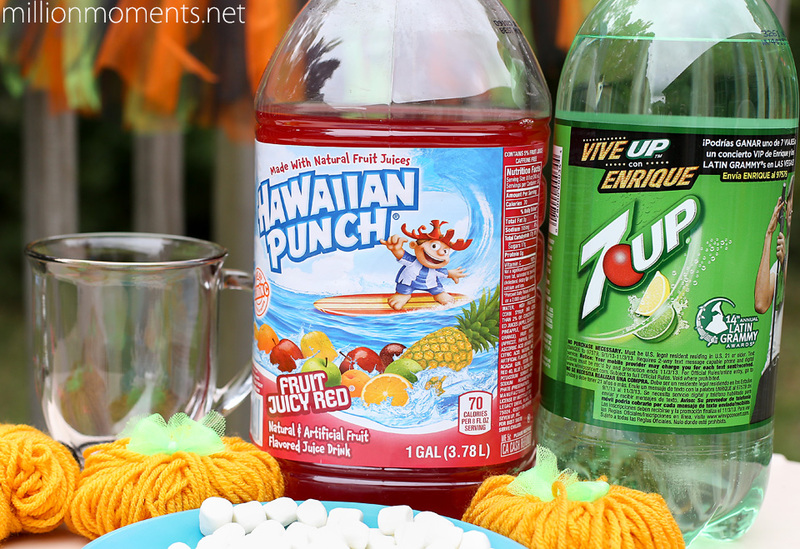 For this all you need is Hawaiian Punch, 7Up, mini marshmallows and candy eyeballs. Pour equal parts of Hawaiian Punch and 7Up into a cup. 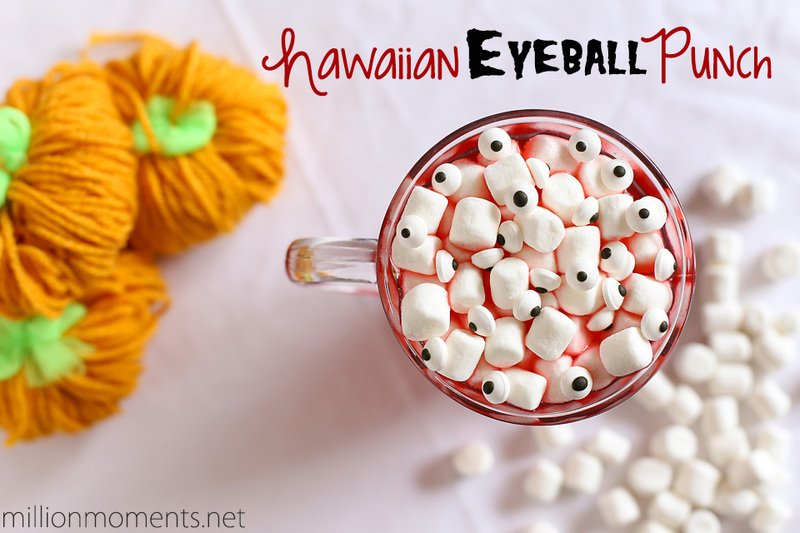 Top with a hand full of mini marshmallows and candy eyeballs and you have a yummy Hawaiian Eyeball Punch! 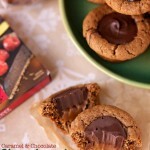 I don’t know about you, but I’m craving something sweet and refreshing right now! 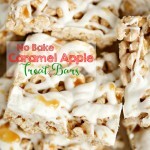 If you’re feeling inspired, here are some more great Halloween recipes to get your taste buds going, and as a bonus here are some coupons to help you out!